Although the updates are still coming for WordPress’ new plugin and improvements are to be expected, Joom United has been working on a new plugin to appease the early-adopters - Advanced Gutenberg. 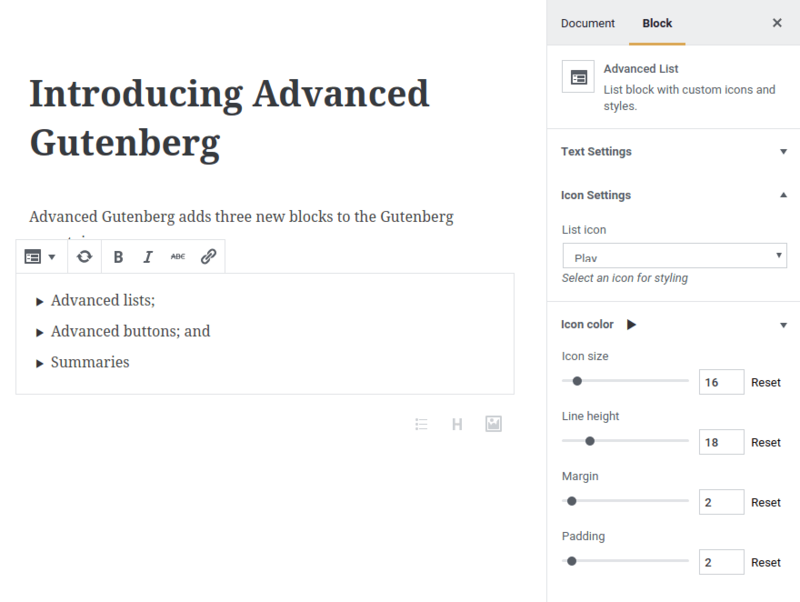 Advanced Gutenberg is an open-source plugin that gives WordPress content creators new tools to enhance their blog and its offering. Since its initial release, Joom United’s Advanced Gutenberg has received new updates that introduce new blocks to the plugin, and ways to customize existing ones. Blocks are the bread and butter of Gutenberg. The core component of any WordPress page or post, blocks are self-contained modules that create the structure of your blog. 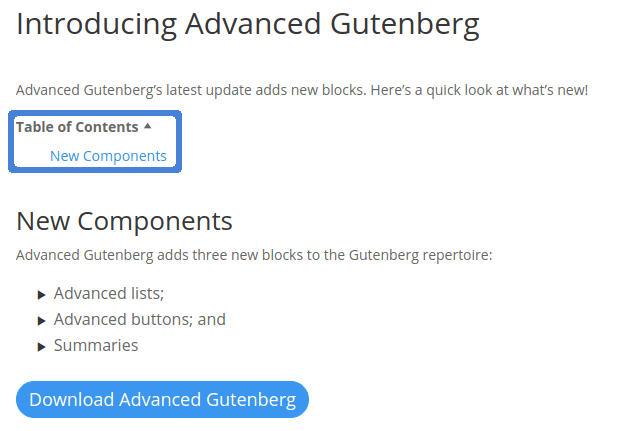 Advanced Gutenberg introduces three new blocks to your repertoire - advanced buttons and lists, and summaries. The simplest new block is arguably the list. Advanced Gutenber’s new list blocks work exactly like normal lists. However, they are more flexible, allowing you to choose the list items’ icon, size and color. Moreover, with advanced lists you can specify the line height, margin and padding. Similarly, Advanced Gutenberg’s newest buttons allow for greater customization, especially when it comes to aesthetics. Apart from the basic style, namely the color, advanced buttons can also be customized with borders, padding and new text options. Perhaps most importantly, buttons can serve a very intuitive role by acting as outgoing links. Advanced Gutenberg goes a step further, and allows content creators to emphasize their interactivity by using hover effects. The final new block that was added to Advanced Gutenberg recently is a summary section. A table of contents is usually desirable when an article spans different categories, or if the article is simply longform. The table of content can be minimized by default, and as you have come to expect, it can be customized in a variety of ways, including with a heading of its own. One of Advanced Gutenberg’s main strengths is its customization potential, even for simple paragraphs. With Advanced Gutenberg, you can create your own styles and apply them to paragraphs. The possibilities are endless, permitting you to enrich your content by creating a custom appearance for quotes, for example. Custom styles can be created from the aptly-named custom styles tab in Advanced Gutenberg’s settings page. Designers and web developers can exploit all of CSS’ capabilities, aided by syntax highlighting and auto-completion. 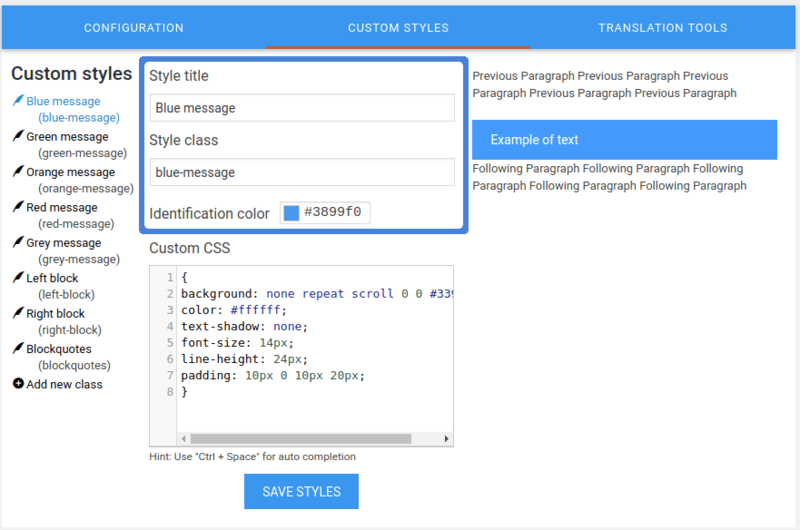 As from Advanced Gutenberg 1.1, it is possible to identify CSS styles in three different ways - the style name, class name and identification color. The latter is visible when editing a post or a page in the backend, and serves as a visual cue to identify the style being used. As WordPress prepares to adopt Gutenberg for good, Joom United is helping you get the most out of your content. Now, with Advanced Gutenberg’s new blocks and custom styles you can break through Gutenberg’s limitations and present your material in the best way possible.